A graduate of Boston Conservatory, Joyce Alper earned master's degrees in oboe and baroque oboe from New England Conservatory. She was awarded a grant from the Frank Huntington Beebe Foundation for study of historical oboe performance at the Royal Conservatory in The Hague, Netherlands. After returning to the States, she taught historical oboes and coached chamber music at the University of North Texas, in addition to teaching a large private studio of middle- and high-school students. She has presented master classes, guest lectures, and workshops at schools and museums including the Boston Museum of Fine Arts, National Music School of the University of Mexico, Boston Conservatory, Louisiana State University, University of Houston, Texas Tech University, the Texas Early Music Festival, and the Gene Byron Museum (Guanajuato, Mexico). She recently participated in an archival recording project at the Boston Museum of Fine Arts, recording historical oboes in the museum's instrument collection. 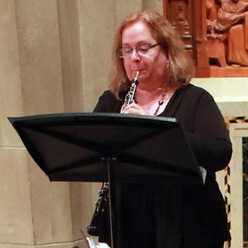 She has played both modern and historical oboes with many ensembles including the Boston Handel + Haydn Society, Boston Cecilia, Cambridge Concentus, Arcadia Players, Cambridge Bach Ensemble, Early Music New York, Baroque Band (Chicago), La Donna Musicale, Musicians of Old Post Road, Harvard University Baroque Orchestra, Texas Baroque Ensemble, Dallas Bach Society, Austin Handel-Haydn Society, Ars Lyrica Houston, Atlanta Baroque Orchestra, New Trinity Baroque, Cappella Barroca de México (Mexico City), Capella Guanajuatensis (Guanajuato, Mexico), Early Music St. Louis, Locust Grove Chamber Players (Louisville, KY), Austin Symphony, San Angelo Symphony, Boston Philharmonic, New England Regional Opera Company, New England Composers Orchestra, Composers in Red Sneakers, Boston Summer Opera Theater, and South Shore Music Circus. She is currently an ensemble leader with Shelter Music Boston, presenting classical music concerts for audiences in Boston-area homeless shelters and rehab programs.